iOS Apps on Sale for Apr 5: Last Year's Best Game is Half Price! iOS Apps on Sale for Apr 5: Last Year’s Best Game is Half Price! 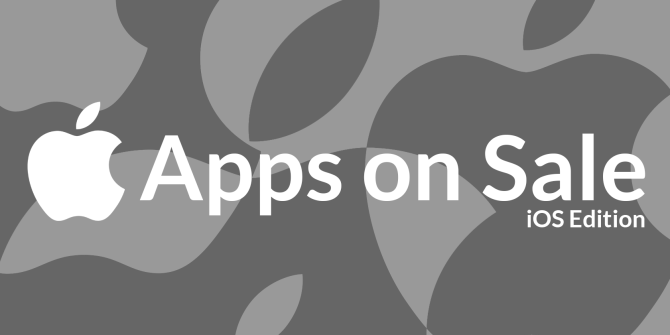 Another week, another flurry of sales and another cherry-picked list of apps to choose from. While iOS users can’t take advantage of promotions like the Humble Bundle 9 Android Apps on Sale, 4 April: Humble Bundle 9 And Games You Need To Touch Android Apps on Sale, 4 April: Humble Bundle 9 And Games You Need To Touch Humble Bundle is awesome, but it isn't all we've got. Luxuria Superbia awaits you inside - and if you've never heard of it, this is one game to experience. Read More , the platform has its own advantages in the form of the best mobile app offers on the web. This week we’ve got a famously Kickstarted daily journaling app, something to help you turn your mobile photographs into beautiful posters and what is widely regarded as being last year’s finest game for half-price. What would your life look like if you played it back, 1-second every day? That’s what 1 Second Everyday is all about – taking one second of video that sums up your day, and creating an overview of your week, month, year or even your entire life. The app even features an in-built reminder function that prompts you to add the day’s clip, either by choosing from your Camera Roll or recording there and then. Wish you could make professional-looking posters but completely lack the graphics design skills to do so? There’s no substitute for talent but Phoster is an app that’s giving it a jolly good go. The universal app allows you to arrange images, apply filters and arrange text in record time, with 197 free templates included with more for sale via in-app purchase. If there’s a mobile or platforming award and Badland hasn’t won it, there’s a good chance it’s not worth winning. This was last year’s breakout hit, combining flying and platforming with beautiful graphics, an immersive world and unputdownable gameplay. This is Badland’s first birthday, and to celebrate developers are giving it away for half price – pick it up now and enjoy if you haven’t already. Ubisoft are having a sale, and that means DrawRace 2 and its iPad-friendly HD sibling are free for a few days. For those of you who aren’t aware, DrawRace is the spawn of RedLynx games – best known for Trials HD and Trials Evolution on the Xbox 5 Reasons Why You Need To Buy Trials Evolution [Xbox 360] 5 Reasons Why You Need To Buy Trials Evolution [Xbox 360] Trials Evolution is the sequel to 2009’s critically acclaimed 2D physics racer, Trials HD. Of course, veteran gamers will recognise the lean-and-land gameplay from games of yore, including the original title in the Trials series... Read More . They know a thing or two about addictive driving games, and so the 32 tracks, 180 challenges and huge assortment of cars on offer here are top-notch. Remember Yatzy, the somewhat irrelevant game of numbers and dice? Well it turns out they have a rather addictive little iOS version, which is currently free. Yatzy Ultimate features three modes of play, both via single and multiplayer modes. It even features a local multiplayer mode that uses Bluetooth, but unfortunately no local pass-and-play. If the combination of Adult Swim and tower defence get your juices flowing, you might be interested in Castle Doombad. The app goes beyond basic tower defence, casting you in the role of Lord Evilstein after having captured a princess. You must now defend your tower from the do-gooders and heroes who will try to save the day. The game features 60 challenging levels, upgradeable placeables and an extremely difficult endless mode to unlock. Featured by us in this column only the other week, and now by Apple as App of the Week, Bulkypix’s gamebook RPG hybrid is free for all to download and enjoy on iPhone and iPad. This download features only the first chapter, but it’s a great way to get started with the world of gamebooks on iOS Pick Your Own Adventure: The World of Gamebooks on iOS Pick Your Own Adventure: The World of Gamebooks on iOS The life of a gamebook adventurer is rough! Are you ready to face down savage foes and clever traps? Read More . If you’re frequently immersing yourself in fantasy tales and adventurous RPGs then you can’t go wrong with this one. That concludes this week’s round-up, see you next weekend for more iOS Apps on Sale.